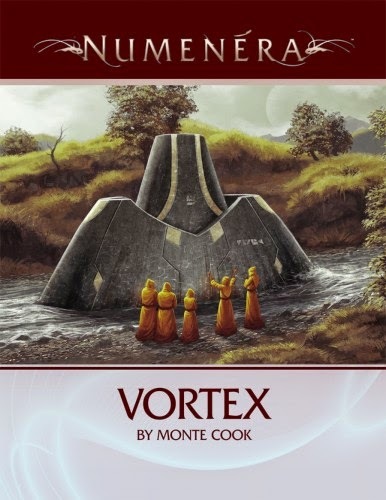 Vortex is a scenario for Monte Cook’s Origins award winning Numenera RPG originally used to launch and showcase the setting and RPG at GenCon 2013. It is designed to challenge three to six characters who should be of either First or Second Tier and is flexible enough to be used as either a demonstration adventure, an introduction to the setting, or as part of an on-going campaign. Available as a 13.42 MB, thirty-page PDF, it includes not only an eighteen-page adventure itself, but also a dozen pre-generated adventurers all ready to play, the latter being available as a 24 MB, twelve-page PDF. Written in two acts, Act I of the adventure, ‘The Temple’, mostly takes place in a wilderness area. The player characters are exploring the region when they come upon a strange structure outside of which be-robed figures are conducting a ritual. Before the characters can interact with the figures they disappear into the structure, but not before leaving behind some food and a notebook. The structure then rumbles into the ground and disappears, but fortunately for the player characters, the notebook contains details as to when and where the structure will reappear. What do the player characters do? Curiosity should be enough for the player characters to follow up on the clues in the notebook. After all, this is the Ninth World and exploring the technologies of the past should be the motivation for many, if not all of the characters in a party. Following up on the clues will bring the characters through a nearby village and present a minor encounter. It is a decent little encounter that given that Vortex is a demonstration scenario serves to show how the Cypher System, the mechanics for Numenera, work in play and give the opportunity for the players to try out their characters’ abilities in a fight. Beyond that, the characters should eventually make their way to the point where the structure is supposed to reappear and when it does, the first person to exit begs for their help—she and her brother have been kidnapped by a cult and they want out! Here begins the real meat of the adventure, the opportunity not only to help out a damsel in distress, but also explore the mysterious disappearing and reappearing structure. It is also here where the adventure picks up and gets a little more interesting. The cult itself should not trouble the player characters unduly, though the cult leader may be a bit of a challenge. Once he has been dealt with, Vortex changes tack and gets a whole lot more interesting. Act II, ‘Through the 'Vortex' draws the characters deeper into the secrets of the Vortex—and beyond! Where the first Act focused on combat and interaction—in the village and then in the strange structure, here the emphasis changes to exploration and examination. If Act I felt a little too much like the traditional start of a Dungeons & Dragons style scenario, then Act II is where Vortex really begins to feel like a Numenera scenario in its Science Fiction. For the switch in emphasis in Act II is ably supported by the weirdness of the setting and the destination that lies ahead of the player characters—if they prevail and uncover the right clues that is. Not that the weird is not present in Act I, for in addition to its combat encounter there are a number of smaller locations to explore and experience, but it comes to the fore in Act II. This is the ‘Citadel of Radiance’, a thoroughly fantastic setting in the truest sense of the word. Vortex can be used as is, or split into two parts, but Act I should only take a session or two to play through at most, whilst Act II will probably take two or three. There is advice on running it as part of a campaign game or a convention scenario, and also on what might happen afterwards, although the given suggestions are a bit slight. There is though, a slightly disjointed feel to the scenario. The whole affair is written more as a pair of sandboxes—one for each act—that the players and their characters are expected to explore and interact with. The issue though is that there is a strong plot that runs through Vortex whilst there really is little for them to just explore and interact at random in true sandbox style. More encounters around both the village and in the strange structure would have supported the sandbox format. Nevertheless, Vortex is a well written, detailed scenario. Vortex also comes with a set of six pre-generated characters. They include two characters of each type and the six do a decent job of showcasing some of the character types possible using the rules in the Numenera core rules.